Iranian President Hassan Rouhani started state visits to Oman and Kuwait on Wednesday at the invitation of their leaders in what appears to be a response to a recent message from the Persian Gulf Cooperation Council (PGCC) for closer ties with Tehran via dialogue. 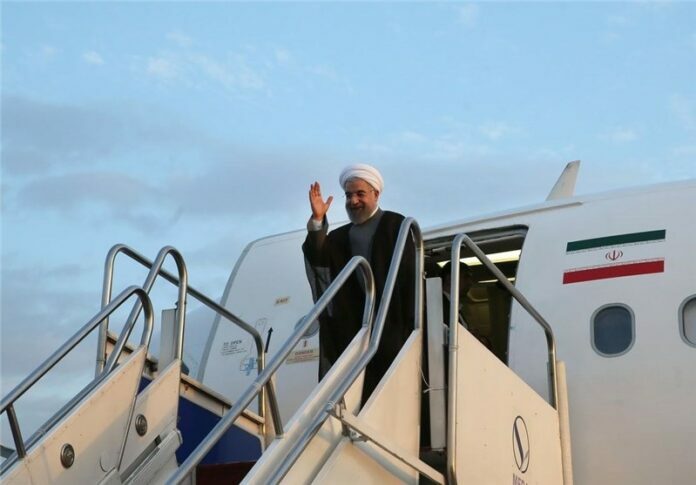 President Rouhani left Tehran for Muscat on Wednesday morning at the invitation of Oman’s Sultan Qaboos bin Said Al Said. Accompanied by a delegation of Iranian ministers, advisors and representatives of the private sector, President Rouhani will leave Oman for Kuwait this evening at the invitation of Kuwait’s Emir Sheikh Sabah al-Ahmad Al-Sabah. He also pointed to a recent message from six members of the PGCC – Saudi Arabia, Kuwait, the United Arab Emirates, Qatar, Bahrain, and Oman – on their willingness to boost relations with Iran and clear up misunderstandings via dialogue and negotiations, saying he “welcomes the essence of the message” and will discuss promotion of cooperation with those Arab states during his visits to Oman and Kuwait. In late January, Foreign Minister of Kuwait Sheikh Sabah Al Khalid Al Sabah paid a visit to Tehran to relay a message from the Kuwaiti emir to President Rouhani. Elsewhere in his remarks, the Iranian president reiterated that Iran’s foreign policy is based upon good neighborliness and protection of the Persian Gulf’s security, stressing that Tehran neither seeks invasion or interference in the internal affairs of the other countries nor plans to impose its religious and political ideas on the others. “Mutual cooperation with the Islamic friend countries and neighbors is a priority,” he underscored. President Rouhani also denounced the “fake” rifts fomented by certain foreign powers, stressing that Sunni and Shiite Muslims have a long history of peaceful coexistence, and the phobia about Iran, Shiites, Sunnis, or neighbors have been all induced by the outsiders. He also unveiled plans for talks on “ending the bloodshed” in Syria, Iraq and Yemen during his visits to the Arab neighbors.